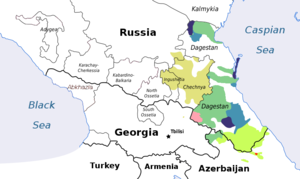 The Northeast Caucasian languages, or Nakh-Daghestanian languages, are a language family spoken in the Russian republics of Dagestan, Chechnya and Ingushetia and in northern Azerbaijan as well as in diaspora populations in Western Europe, Turkey and the Middle East. They are occasionally called North Caspian, as opposed to North Pontic for the Northwest Caucasian languages. Several names have been in use for this family. The most common term, Northeast Caucasian, contrasts the three established families of the Caucasus language area: Northeast Caucasian, Northwest Caucasian (Abkhaz–Adyghean), and South Caucasian (Kartvelian). This may be shortened to East Caucasian. The term Nakh(o)-Dagestanian can be taken to reflect a primary division of the family into Nakh and Dagestanian branches, a view which is no longer widely accepted, or Dagestanian can subsume the entire family. The rare term North Caspian (as in bordering the Caspian Sea) is only used in opposition to the use of North Pontic (as in bordering the Black Sea) for the Northwest Caucasian languages. Historically, Northeast Caucasian phonemic inventories were thought to be significantly smaller than those of the neighboring Northwest Caucasian family. However, more recent research has revealed that many Northeast Caucasian languages are much more phoneme-rich than previously believed, with some languages containing as many as 70 consonants. In addition to numerous oral obstruents, many Northeast Caucasian languages also possess a number of back consonants, including uvulars, pharyngeals, and glottal stops and fricatives. Northeast Caucasian phonology is also notable for its use of numerous secondary articulations as contrastive features. Whereas English consonant classes are divided into voiced and voiceless phonemes, Northeast Caucasian languages are known to contrast phones into voiced, voiceless, ejective, and tense variants, which contributes to their large phonemic inventories. Some languages also include palatalization and labialization as contrastive features. Most languages in this family contrast tense and weak consonants. Tense consonants are characterized by the intensiveness of articulation, which naturally leads to a lengthening of these consonants. In contrast to the generally large consonant inventories of Northeast Caucasian languages, most languages in the family have relatively few vowels, although more on average than the Northwest Caucasian Languages. However, there are some exceptions to this trend, such as Chechen, which has at least twenty-eight vowels, diphthongs, and triphthongs. These languages can be characterized by strong suffixal agglutination. Weak tendencies towards inflection may be noted as well. Nouns display covert nominal classification, but partially overt cases of secondary origin can be observed too. The number of noun classes in individual languages range from two to eight. Regarding grammatical number, there may be a distinction between singular and plural, plurality itself may impact the class to which a noun belongs. In some cases, a grammatical collective is seen. Many languages distinguish local versus functional cases, and to some degree also casus rectus versus casus obliquus. The inflectional paradigms are often based on partially classifying productive stem extensions (absolutive, and oblique, ergative, and genitive inflection. [clarification needed] Localization is mostly conveyed by postpositions, but it can be also partly based on preverbs. Noun phrases exhibit incomplete class agreement, group inflection[clarification needed] (on the noun) with partial attributive oblique marking, which may, in turn, carry a partially determining function. Most Northeast Caucasian languages exhibit an ergative–absolutive morphology. This means that objects of transitive sentences and subjects of intransitive sentences both fall into a single grammatical case known as the absolutive. Subjects of transitive sentences, however, carry a different marking to indicate that they belong to a separate case, known as the ergative. This distinction can be seen in the following two Archi sentences. Note that objects and subjects of intransitive sentences carry no suffix, which is represented by the null suffix, -∅. Meanwhile, agents of transitive sentences take the ergative suffix, -mu. Mother works. Mother is baking the bread. Blue is used to mark ergative markers, as well as and transitive agents in the English translations. Red is used to mark null morphemes, as well as transitive objects and intransitive subjects in the English translations. Northeast Caucasian languages have between two and eight noun classes. In these languages, nouns are grouped into grammatical categories depending on certain semantic qualities, such as animacy and gender. Each noun class has a corresponding agreement prefix, which can attach to verbs or adjectives of that noun. Prefixes may also have plural forms, used in agreement with a plural noun. The following table shows the noun–adjective agreement paradigm in the Tsez language. Colors are used to emphasize agreement between adjectival prefixes and noun classes. A long-time classification divided the family into Nakh and Dagestanian branches, whence the term Nakho-Dagestanian. However, attempts at reconstructing the protolanguage suggest that the Nakh languages are no more divergent from Dagestanian than the various branches of Dagestanian are from each other, although this is still not universally accepted. The following outline, based on the work of linguist Bernard Comrie and others, has been adopted by Ethnologue. An Avar–Andi–Dido branch was abandoned, but has been resurrected as the "New Type" languages in Schulze (2009, 2013), and Lak–Dargwa has likewise returned. Population data is from Ethnologue 16th ed. Figures retrieved from Ethnologue. These languages are spoken in the following rayons of Dagestan: Axvax, Botlikh, Buynaksk (Shura), Čarodinsky (Tsurib), Gergebil, Gumbetovsky (Baklul), Gunib, Karabudaxkent, Kazbekovsky (Dylym), Lavaša, Tsumada (Agvali), Untsukul, Xebda, Xunzaq and Zaqatala rayon in Azerbaijan. Spoken by 492,490 in Dagestan, as well as Azerbaijan, Central Asia, and Ukraine. Dargwa proper is a literary language. Dargwa is spoken in the following rayons of Dagestan: Aquša, Kaitak, Kayakent, Kubači, Sergokala. Spoken in Quba rayon of Azerbaijan. Spoken in the Central Dagestan highlands. Lak is a literary language. Lak is spoken in two rayons of Dagestan: Kumux and Kuli (Vači). Spoken in the Southeast Dagestan highlands and in Northern Azerbaijan. The Lezgian language or, as the Lezgian people themselves call it, Лезги чlал (lezgi ch'al), is the biggest in terms of the number of native speakers of all the languages of the Lezgic group (other languages from this group include Tabasaran, Udi, Tsakhur, and Rutul). They are spoken in the following rayons of Dagestan: Agul, Axty, Derbent (Kvevar), Kasumxur, Kurax, Magaramkent, Rutul, Tabasaran, Usuxčay, Xiv and Quba and Zaqatala in Azerbaijan. Tabasaran was once thought to be the language with the largest number of grammatical cases at 54, which could, depending on the analysis, instead be the Tsez language with 64. Lezgian and Tabasaran are literary languages. All figures retrieved from Ethnologue. Spoken in Chechnya, Ingushetia, and Georgia. 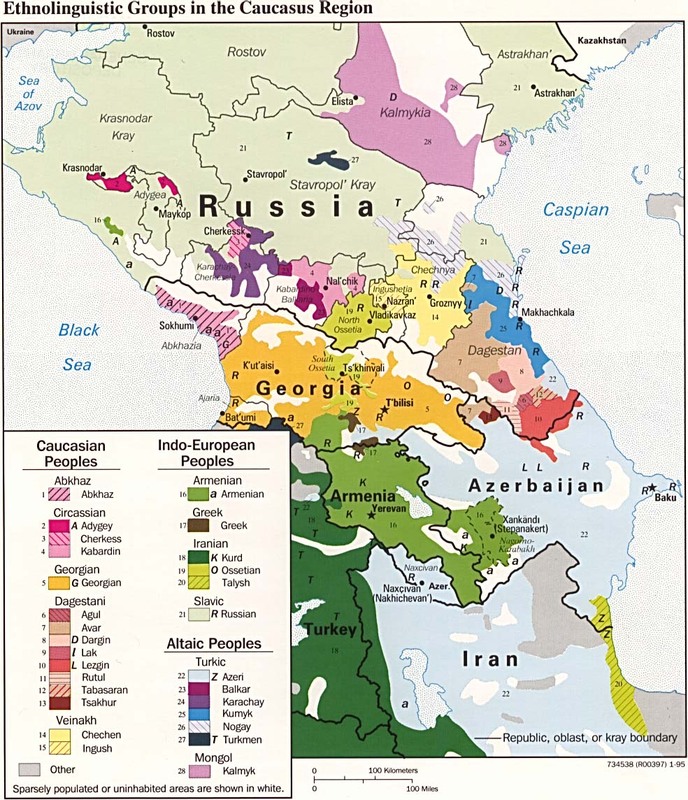 Chechen and Ingush are official languages of their respective republics. All figures except for Khwarshi were retrieved from Ethnologue. These languages are spoken in Tsuntsin and Bežta areas of Dagestan. Some linguists such as Sergei Starostin think that the Northeast and Northwest Caucasian languages are part of a wider North Caucasian family, citing shared vocabulary and typological features as evidence. This proposed family does not usually include the neighboring Kartvelian languages. This hypothesis is not well demonstrated. Some linguists—notably Igor M. Diakonoff and Starostin—see evidence of a genealogical connection between the Northeast Caucasian family and the extinct languages Hurrian and Urartian. Hurrian was spoken in various parts of the Fertile Crescent in the 3rd and 2nd millennia BC. Urartian was the language of Urartu, a powerful state that existed between 1000 BC or earlier and 585 BC in the area centered on Lake Van in current Turkey. The two languages are classified together as the Hurro-Urartian family. Diakonoff proposed the name Alarodian for the union of Hurro-Urartian and Northeast Caucasian. The Proto-Northeast Caucasian language had many terms for agriculture, and Johanna Nichols has suggested that its speakers may have been involved in the development of agriculture in the Fertile Crescent, and only later moved north to the Caucasus. Proto-NEC is reconstructed with words for concepts such as yoke, as well as fruit trees such as apple and pear, that suggest agriculture was well developed before the proto-language broke up. ^ Hammarström, Harald; Forkel, Robert; Haspelmath, Martin, eds. (2017). "Nakh–Daghestanian". Glottolog 3.0. Jena, Germany: Max Planck Institute for the Science of Human History. ^ Hewitt, George (2004). Introduction to the Study of the Languages of the Caucasus. Munich: Lincom Europaq. p. 49. ^ Hewitt, George (2004). Introduction to the Study of the Languages of the Caucasus. Munich: Lincom Europa. pp. 49–54. ^ a b Matthews, W.K. (1951). Languages of the U.S.S.R. New York: Russel & Russel. p. 88. ^ Hewitt, George (2004). Introduction to the Study of the Languages of the Caucasus. Lincom Europa. p. 58. ^ Hewitt, George (2004). Introduction to the Study of the Languages of the Caucasus. Munich: Lincom Europa. p. 80. ^ Hewitt, George (2004). Introduction to the Study of the Languages of the Caucasus. Munich: Lincom Europa. pp. 81–82. ^ Dixon, R.M.W. (1987). Studies in Ergativity. Amsterdam: Elsevier Science Publishers B.V. p. 133. ^ Van Valen, Robert D. (1981). "Grammatical Relations in Ergative Languages" (PDF). Studies in Language. 5.3: 361–394. Retrieved 19 April 2013. ^ Van Valin, Jr., Robert D. (1983). "Grammatical Relations in Ergative Languages" (PDF). Studies in Language (5.3): 361–394. Retrieved 19 April 2013. ^ a b Plaster, Keith; et al. "Noun classes grow on trees: noun classification in the North-East Caucasus". Language and Representations (Tentative). Retrieved 20 April 2013. ^ "Ethnologue". Ethnologue. Retrieved 14 March 2015. ^ "Ethnologue report for Dargwa". Retrieved 18 April 2013. ^ "Ethnologue report for Khinalugh". Retrieved 18 April 2013. ^ "Ethnologue report for Lak". Retrieved 18 April 2013. ^ "Ethnologue". Retrieved 18 April 2013. ^ "Bats". Ethnologue. Retrieved 14 March 2015. ^ "Chechen". Ethnologue. Retrieved 14 March 2015. ^ "Ingush". Ethnologue. Retrieved 14 March 2015. ^ Khalilova, Zaira (2009). A Grammar of Khwarshi (PDF). University of Leiden: LOT, Netherlands. ISBN 978-90-78328-93-3. ^ Pereltsvaig, Asya (2012). Languages of the World: An Introduction. Cambridge: Cambridge University Press. p. 65. ^ a b Matthews, W.K. (1951). Languages of the U.S.S.R. New York: Russell & Russell. pp. 87–88. ^ Nichols, J. 1997 Nikolaev and Starostin's North Caucasian Etymological Dictionary and the Methodology of Long-Range Comparison: an assessment Paper presented at the 10th Biennial Non-Slavic Languages (NSL) Conference, Chicago, 8–10 May 1997. WUETHRICH, Bernice (19 May 2000), "Peering Into the Past, With Words", Science, 288 (5469): 1158, doi:10.1126/science.288.5469.1158. This page was last edited on 18 March 2019, at 18:50 (UTC).